The constraints facing CCF and forestry in general can be grouped into the areas of the Physical, Economic and Social Environments, along with Information Resources and Expertise Base. Physical Environment can be further divided into Abiotic factors; such as storms and Biotic factors; such as Deer. Recent experience by the forestry industry in Germany has shown that the damage caused by storms is inevitable, although this has had greater consequences (both economically and ecologically) in plantations than under CCF. Further factors (ice, snow and bark boring insects) appear to have similar consequences. Thanks to the filtering effect of a well-thinned stand with a high degree of structure, high exposure is a greater constraint to plantation forestry than to established CCF. Plantation forestry overcomes this constraint by relying on hardy pioneer species. A number of useful species are not found in Ireland or are not native (e.g. Boar). Tree species that are an integral part of selection forestry in Europe, but are not native to Ireland are Beech, Sycamore, Silver Fir and Norway Spruce. Without these species a true Selection Systems is not possible. By using species that are not native but appear to be compatible with native forest ecosystems, the understanding of the ecological relationships within such an ecosystem is reduced. It’s this understanding that helps minimise costs in a Continuous Cover Forest. With the Group Selection System more light is required on the forest floor increasing the risk of weeds, such as grasses. Once established light-demanding species will need to be given much more room; they won’t wait like Beech or Fir. A number of introduced species have affected the balance within our ecosystems (e.g. Grey Squirrel, Sika Deer and Rhododendron ponticum) and their eradication or integration into our management systems is a daunting challenge. A further constraint to the principles of CCF in Ireland is the general absence of autochthon (local) populations of tree species. Irish forests are dominated by introduced species with a low degree of ‘naturalness’. Forests are highly splintered: According to Leibundgut the minimum woodland size required to manage a forest with the Group Selection System is greater than that needed for the true Selection Systems; at least 5 to 30 ha (Leibundgut, 1990, Waldbau im Privatwald, Haupt, Stuttgart). Forests are often under-thinned or plundered increasing the stand instability and reducing the feasibility of conversion to CCF. Few examples of CCF exist in Ireland with only c. 7% of the landmass forested; practically all of this is plantation forestry and mainly conifer monocultures. Soils have been degraded, particularly on marginal land earmarked for forestry. Infrastructure, such as forest roads and ride lines, as well as less obvious resources such as high seats and experimental plots, are poor. These are essential in order to practice good forest management and in particular CCF. When looking at CCF compared to Plantations regarding stand stability we conclude that plantation forestry changes the constraining site conditions through drainage, fertilizer and further inputs, while CCF forestry uses mainly native species adapted to site conditions to improve them over time and increase stability. These fundamental differences require a change in the mindset of foresters in Ireland as well as a long-term commitment. The economics of established Continuous Cover Forestry are impressive, but conversion results in a delay in the return on the initial investment. Part of the investment remains committed indefinitely. This requires a longer-term approach to forestry than presently exists. 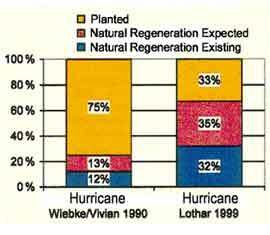 The table shows the reduced reliance on costly planting after two major storms in Germany (Table: v. Gilsa H and Moosmayer M, Wiederbewaldung nach “Lothar”, AFZ/Der Wald 16/2002). As a society our tradition of forestry management is limited. The publics’ relationship with forests and forest management has been relatively poor over the last 100 years or so. The multi-functional nature of all forests and the need to utilize land resources sustainably has had little acceptance up to recently. This, I believe, is reflected in the present Irish forestry policy. CCF should not be seen to be in direct competition with plantation forestry, but rather is a better management systems once forests have been established. This is becoming increasingly apparent as our information resources improve. The continued lack of such information, as well as the poor forest infrastructure, are considerable constraining factors to CCF practice in Ireland. Despite the constraints outlined here, existing plantations need to be accepted as a stage in the succession to managing forests under Continuous Cover Forestry. Such Continuous Cover Forests are made up of species that often require the pioneer function of plantations (made up of hardy species), but out-perform such a plantation once converted. The design and management of plantations needs to be adapted to improve this conversion to CCF.